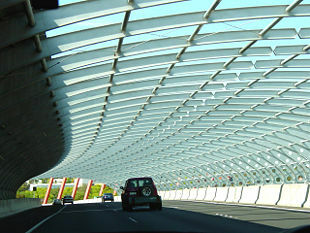 The principles of acoustics were used in designing this sound tube in Melbourne, Australia. It was constructed to reduce roadway noise without detracting from the area's aesthetics. Acoustics is a branch of physics that studies sound, or more precisely, mechanical waves in gases, liquids, and solids. It is concerned with the production, control, transmission, reception, and effects of sound. A scientist who works in the field of acoustics is called an acoustician. The application of acoustics in technology is called acoustical engineering. There is often much overlap and interaction between the interests of acousticians and acoustical engineers. Knowledge gained through the field of acoustics has had great significance for applications related to artistic expression. The development of acoustic technology has also been important in the study of geologic, atmospheric, and underwater phenomena. In addition, ultrasound technology has led to important developments in medicine. The study of acoustics has been fundamental to many developments in the performing arts. Many of the principles of acoustics, especially in the area of musical scales and instruments, were explained theoretically by scientists only after long years of experimentation by artists. For example, much of what is now known about architectural acoustics was learned by trial and error over centuries of experience and only recently formalized into a science. From a scientific viewpoint, sound waves are a form of mechanical vibrations (or mechanical waves). When the ear receives these waves, the signals are transmitted to the brain, which interprets them as sound. The study of sound waves led to the discovery of physical principles that can be applied to the behavior of all mechanical waves. Acoustics, therefore, involves the study of mechanical vibrations in general and the potential applications of the knowledge gained in modern life. …[A]coustics is characterized by its reliance on combinations of physical principles drawn from other sources; and that the primary task of modern physical acoustics is to effect a fusion of the principles normally adhering to other sciences into a coherent basis for understanding, measuring, controlling, and using the whole gamut of vibrational phenomena in any material. As noted earlier, the study of acoustics has been of fundamental importance for developments in the arts. Other applications of acoustics technology are in the study of geologic, atmospheric, and underwater phenomena. Psychoacoustics, the study of the physical effects of sound on biological systems, has been of interest since Pythagoras first heard the sounds of vibrating strings and hammers hitting anvils in the sixth century B.C.E. However, the application of modern ultrasonic technology has only recently provided some of the most exciting developments in medicine. Daniel Statnekov and others have recently been studying the effects of sound on the human brain. Harmonic frequencies in the form of binaural beats can affect the brainwave patterns of a person who plays an ancient Peruvian Whistling Pot to create a "trance state." ↑ S. C. Woodhouse, English-Greek Dictionary (Abingdon, UK: Routledge, 1910), 392. ↑ F. V. Hunt, Origins in Acoustics (Yale University Press, 1978). ↑ Fields of Acoustics Acoustical Society of America. Retrieved June 14, 2018. ↑ Daniel K. Statnekov, Peruvian Whistling Vessels Retrieved June 14, 2018. All links retrieved June 14, 2018. This page was last modified on 14 June 2018, at 23:27.